It is common for women to experience mental ill health for the first time during pregnancy. Women may feel more vulnerable, anxious and some may develop depression. If a woman on prescribed medication discontinues her antidepressants during pregnancy, then it can precipitate a relapse of depressive symptoms. Prenatal depression (depression during pregnancy) – The American College of Obstetricians and Gynecologists (ACOG) and The American Psychiatric Association (APA) sate that between 14-23% of women will experience symptoms of depression during pregnancy. Symptoms of prenatal depression include frequent crying, trouble sleeping, fatigue, change in appetite, loss of enjoyment of pleasurable activities, heightened anxiety, trouble feeling connected to the developing baby. Prenatal depression is the most common mental illness experienced by pregnant women and yet it is often under detected and under treated by health care providers. Bipolar disorder (BD) – Pregnant women with bipolar disorder have seven times the risk of being admitted to hospital compared to a pregnant woman who does not have bipolar disorder. BD can worsen during pregnancy and symptoms are characterized by mood swing cycles between mania (feelings of high energy) and depression (feelings of sadness and hopelessness). For this reason, a thorough review of medications the patient is taking for their condition should be conducted. It was found that women who stopped taking bipolar medications during pregnancy had twice the risk of relapse, a 50% recurrence of symptoms within two weeks of ceasing medication if stopped suddenly and bipolar symptoms existed throughout 40% of their pregnancy or more than four times that of women who continued their bipolar medications. Schizophrenia – As with BD symptoms of Schizophrenia can worsen during pregnancy and a medication review should be conducted with the patient. Symptoms of Schizophrenia include hallucinations, delusions, confused thoughts and speech, and trouble concentrating. Panic disorder – This tends to be a pre-existing condition and may result in increased symptoms during pregnancy, although some people have reported a reduction of symptoms when pregnant. Emotional symptoms include sudden feelings of fear, anxiety, nervousness and apprehension. Physical symptoms may include accelerated heart rate, chest pain, light headedness, shaking, nausea and numbness. A referral to a psychotherapist will help the patient cope with their symptoms and fears whilst pregnant. Eating disorder – Although the chances of pregnancy tend to decrease in a patient who has an eating disorder the chance of pregnancy can still occur. As good nutrition and hydration are important to both mother and child for a successful pregnancy and delivery then good team work between care provider and patient is essential with extra appointments, consultation with a dietician and support groups for pregnancy, childbirth, child development and groups who support eating disorders. Obsessive-compulsive disorder (OCD) – This can be a pre-existing condition or pregnancy can be a trigger for it to occur. Symptoms include thoughts or images which keep entering their mind (obsessions), anxiety, and actions or thoughts they keep repeating to reduce their anxiety (compulsions). In pregnancy, this could involve excessive washing as the woman has an intense fear the developing baby will be contaminated by germs or dirt, or repeatedly asking people that everything is alright with the pregnancy. Women with prenatal OCD often realize their symptoms are unreasonable and excessive but may not seek help for fear of feeling ashamed. Health care providers should enquire about prenatal OCD when discussing other psychiatric conditions in pregnancy. If not discussed and detected, then symptoms could worsen leading to other conditions including depression. Generalized anxiety disorder (GAD) – 8.5-10.5% of women who are pregnant will experience GAD. The disorder tends to be under-diagnosed and it may be difficult to distinguish from normal worrying. Untreated GAD may lead to pregnancy complications including low birth weight, preterm delivery, high blood pressure and failure to progress during labor. Symptoms of GAD include persistent worrying and anxiety out of proportion to the impact of events, overthinking plans and solutions, difficulty concentrating, difficulty handling uncertainty, inability to relax, restlessness, fatigue, trouble sleeping and muscle aches. Treatment options include psychoeducation, cognitive-behavioral therapy (CBT), support groups and medication may be necessary after careful evaluation. Pseudocyesis – A woman believes herself to be pregnant and develops objective signs of pregnancy such as abdominal enlargement, menstrual disturbance, apparent fetal movements, nausea, breast changes, labor pains, uterine enlargement, urinary frequency, cervical softening and a positive pregnancy test. On examination and after being examined and other conditions excluded (including ectopic pregnancy, corpus luteal cyst, placenta previa, pituitary tumor and pelvic tumor) it is found the patient is not pregnant. Pseudocyesis is regarded as a somatoform disorder or a variant of depression. It may present as psychosis with amenorrhea. Treatment includes psychotherapy and a trial of an antidepressant. Psychological disorders occurring during pregnancy can result from prior existing medical conditions or can develop as new entities during pregnancy. As they can seriously impact the mother’s physical and mental health as well as the fetus’s development, timely screening and appropriate treatment are essential to prevent needless suffering and ensure a safe delivery of a full-term baby. Healthcare providers caring for pregnant women are uniquely situated to address these symptoms and illnesses and ensure the patient receives the best possible care. As symptoms can overlap and are similar between the various conditions, a thorough examination, history and differential diagnosis are essential to determine the final diagnosis and ensure the patient receives the treatment they need. 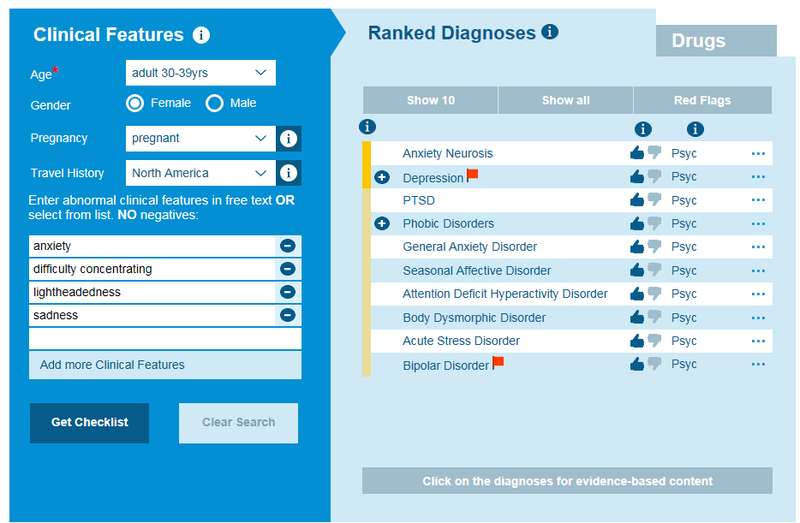 Using tool like the Isabel DDx Generator will ensure you have considered both physical and cognitive symptoms with your patient. Have you read our white paper on patient engagement and symptom checkers? Download your copy below and let us know what you think.